LOVE this place. The campgrounds are sort of terraced, so the spaces seem more spacious. The managers are super nice and welcoming. We had a tree and grass by our RV../.A nice bonus There is a pool that we didn't use, but I imagine would be great in the heat of summer. The fenced dog area is large for a romp for any canine! Lots of places to walk. The bathrooms are spotless and decorated so darn cute...you will smile! The laundry area is spacious and the machines all clean. There is a small store that also has some craft products for sale. We enjoyed the location (quiet) and its proximity to some good country restaurants! We will definitely stay here again if we're in the area. Outstanding folks and accommodations. Their goal to provide great service and comfort was impressive. Delightfully decorated, especially the laundry and restrooms. Great wifi. We stayed at this campground just overnight to points West and North. Perfect layover. Being a Sunday afternoon, park was all but empty. Our site was fairly level requiring only slight adjustments from the trailer jacks. We stayed attached to our tow vehicle and there was plenty of room left on our site so as to not block traffic. Site was open and we received full satellite acquisition. Campground was clean and staff was very cordial and accommodating. Park has a pool, dog park, pond, lawn games and several tree stump carvings by a very talented artist. Camp office also has small store/camping items available. Did not use or visit laundry room or rest rooms. Utilities were well located at our site (27) for our trailer. Some sites have opposing parking so if making reservations and have a preference, it is worth looking at their online park map before making the reservation. Great park and would definitely stay again. We have stayed in about 20-30 campgrounds across the mid-west in our limited experience. 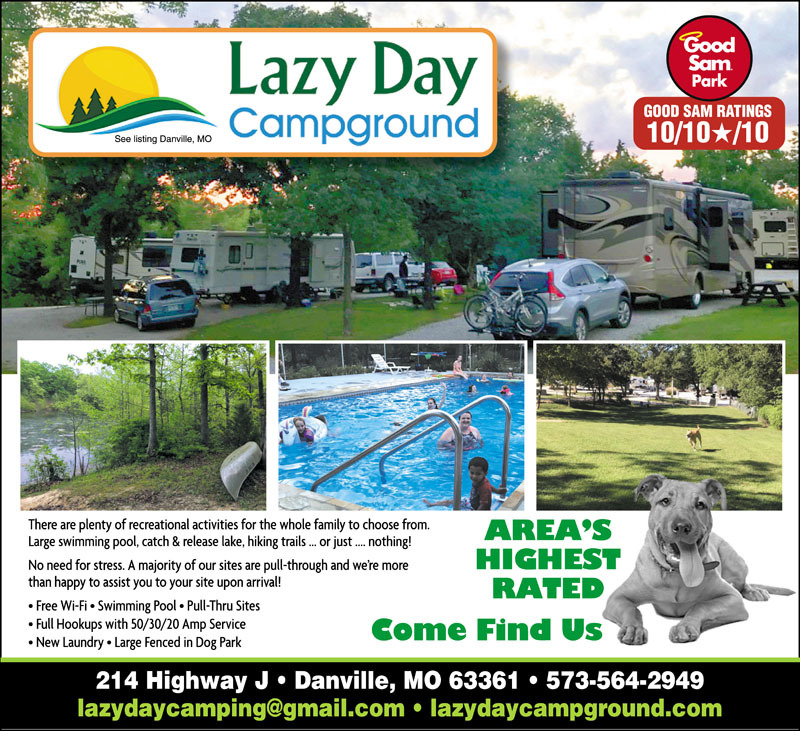 While there are a couple of other campgrounds which we have visited that have more amenities, Lazy Day Campground is our favorite.. The only negative comment is the ease of access as it is several miles from the interstate access points. The flip side of that is that it is quiet. Stayed at Lazy Days campground on our way to Yellowstone and again on our way back to Tennessee.. Camp ground was very clean and neat, owners super friendly and helpful. Bathrooms were spotless and smelled nice. This is a very well maintained campground with gravel on all the roads and sites! The campground staff is very friendly and will ensure you have everything you need to enjoy your stay. The sites are easy to get into and the facilities are very clean. We have recommended this campground to our family already and would recommend it to anyone for a several day stay or just an overnight. Peaceful and quiet; 1.5 miles away from I-70. Well kept grounds, friendly and helpful staff. Will stay again. Nice little park. It is far enough off the highway to be very quiet. The park is very cute and clean. The laundry facilities are very clean and well maintained. Owners have fun things to do like movie nights and ice cream socials over the Memorial Day weekend. I would highly recommend this park to anyone crossing MO. Stayed one night on our way to Colorado. Very nice park with good scenery. Owners were very gracious. There is an area fenced for dogs to exercise. Their little store was nice too. We arrived on a very rainy afternoon and the owners even escorted us to our site. Would highly recommend staying there. This campground is well-maintained and the man who greeted us was friendly and helpful. He led us to our site and helped us get situated. The grounds are gravel, not paved, and the spacing between sites is a little bit close for my tastes, but the sites are relatively level and since we went during the off-season there weren't many campers near us. The gravel sites themselves are nicely sized and it's very quiet, which was a pleasant surprise due to its proximity to the interstate. They have very nice facilities (laundry/bathhouse) and even have a good-sized dog run. We would definitely stay again, as long as it's off-season. 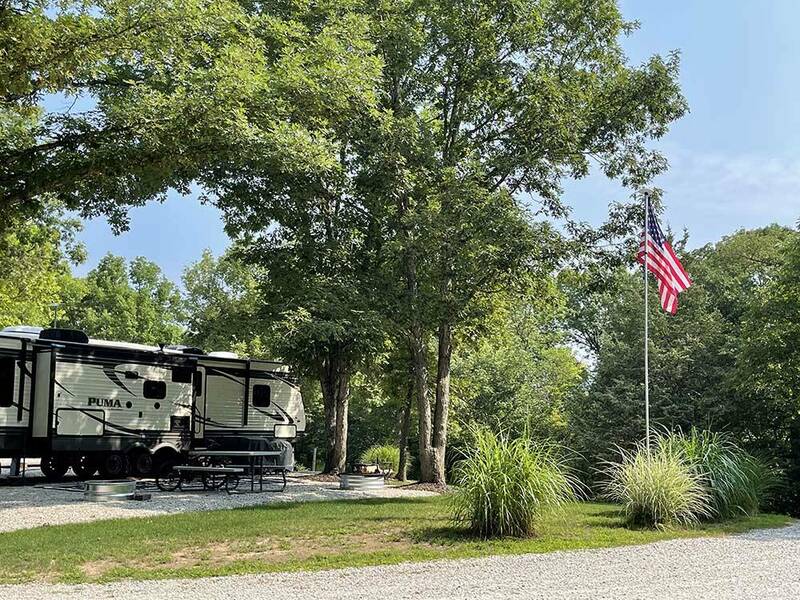 This is a very clean and well-maintained campground for RV's of all sizes. Convenient to I-70 but very little road noise. The large dog park is a big benefit. The owner/manager was very friendly and helpful. The sites are gravel that is in good condition. We will stay here again. One of the best parks we stayed in. The owners were extremely nice. The gardens were beautiful. The owners efforts are obvious. The park was clean. We would definitely stay again. We stayed one night purely by chance: called during a very long day on the road. Arrived near dark to a very friendly greeting; escorted to our drive through spot (flat and perfect). Hook ups placed just right. Really didn't see the place until morning. Amazing: the whole park is kept better than my own yard. Landscaped; immaculate. It gets better: the combination bath house/laundry facility is the best we have ever seen at a state or private park. Not just spotless; tile; painted whimsical designs on all surfaces (even in the stalls). The mens room has walls painted to look like wood planks and has a real Dodge truck mounted on one wall to appear as if it crashed through. Saw the great swimming pool from a distance. Wish we had a week there. If we ever get back that way, no way we will pass it up. Possibly the best RV park you will ever find. Very nice campground with spacious sites off the interstate. Had a great view of surrounding hills with plenty of room to park with toad connected. Restrooms were really cool and decorated well. Very clean. Nice size dog park to let the dog burn off steam after a day in the RV! We stayed for one night on our trip heading west. The owner was very friendly and she answered any questions we had regarding the area. Our site was very clean and easily accessible with our 35' fifth wheel. All their sites are pull-thru. Bathrooms and laundry room were very clean. Pool was not open yet. This is our second year staying here at Lazy Day CG on our way West. It is one of the best that we have ever stayed at, wishing it where closer to our home in Northern Ky so we could frequent it more often. The grounds are beautiful and the whole park is well manicured and clean. Thank you Lazy Day CG! I stayed two nights, and found this park very worthy of 5 stars. Lets start with the sites. All of the sites are very clean and well maintained (gravel is clean, not over run with weeds). Grass is also well maintained, and trimmed. I didn't need it but a 30-50 amp adapter was available at the site for use. The overall park is extremely clean and neatly decorated. The owner escorted me to my site and stopped back by to make sure I got settled in. There are seasonal campers at this park, however unlike many other parks I have been to, theses sites are kept very clean and uncluttered. The restrooms and showers are immaculately clean and more the accommodating, even having one that is handicap accessible in the men's room ( assuming to be the same for the ladies.) A very nice size fenced dog park is available to let the hounds run free for a bit. As far as the rules that one had commented on as being over bearing, I found to be a non issue and are in place only to provide a safe, and enjoyable experience for the customers they want to attract. With out hesitation, I would recommend this park to anyone looking for a peaceful, relaxing, and overall enjoyable get away, or as a stop over on a long trip. We stayed here for one night on a cross country relocation in early April. It was nice to be away from the freeway noises, but the distance was not excessive. The grounds are lovely and well maintained, and you can tell the owners take pride in the area. The use of the spaces were well utilized, this early in the season we had empty slots on both sides of our pull through site. I would have enjoyed staying here for multiple days in this peaceful area. They have a nice large off leash dog area as well as grass between slots. Our old dog appreciated that convenience. We didn't use the restrooms or the pool so couldn't comment on those features. The bathrooms were clean, no where to put your clothes except outside of the shower. Park is nicely maintained. But the owners watch you like a hawk. They have so many rules, I am surprised that they let you breath in there. You have to have rules, but these were over the top and completely controlling. Even though it was clean, I would not stay there again.